Flint Expatriates: Alan MacLeese, R.I.P. "After serving four years in the Navy during the Korean War, he began his newspaper career at the Miami Herald, followed by work at more than two-dozen other newspapers across the country, from San Francisco to Boston, some of them more than once as he was hired and fired -- or never showed up for work. "He began work at The Journal in 1968 and stayed far longer than he had at any other paper. He told about being hired at the Journal earlier in the 1960s, then not ever showing up in the newsroom because he was off on a drinking spree. Despite that disappearance, the Journal hired him again, perhaps a testament to his abilities as a copy editor. 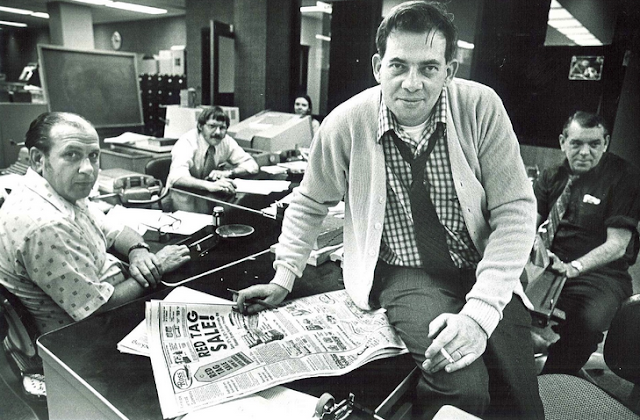 "He served as the Journal’s copy desk chief and also as columnist, 'MacLeese Unleashed.' He told stories, and wrote frankly about his experiences and his demons, with wit and a highly personal style." Go here to read the rest. It's worth it. Note the cigarette in Alan's hand. Now that's a newsroom photo. I learned more about journalism from Al than I did from anyone ... he was the genuine article, the kind of colleague I haven't been privileged to encounter since and never hope to. Especially with that newsroom photo, which appears to be right out of a movie, is there enough material to write a screenplay in honor of Alan's life? If Mitch Albom can do it, certainly some of the Flint Expatriate readers here could! The guy sitting behind Al on the right was Bud Tripp. There's a movie's worth of material alone on those two, except no one would ever believe it. If we had more MacLeese's and fewer Albom's, journalism would be a lot better off. One of my roommates in Little Rock, Arkansas worked at one of the daily papers there while I worked at the weekly alternative. He said the old desks in the newsroom were still covered with cigarette burns. Truly a different era. That picture of the newsroom also brought to mind another Flint Expatriate, who taught English, Speech, and Debate at Flint Southwestern High School from 1963 to 1970. His name was Jesse Champion, and he left Flint to return to his native Birmingham, Alabama to work in radio news, in which he had previously worked, along with teaching, before being told to leave Birmingham by Bull Connor. The following link shows a picture of Jesse smoking his pipe while correcting a news story on a manual typewriter. His is another fascinating Flint Expatriate life story, but which begins and ends in Birmingham. A true gonzo journalist before the word became a cliche.The Journal article about his life and times is a true gem itself. Worthy of some sort of recognition.They don't make people like that anymore, and we are all the poorer for it. Flint: What's in a Name?